Jake Averi was 18 when he became homeless and on his own. He moved out of his foster home a month after aging out of the system and, despite his best efforts at getting and keeping his own apartment, within six months he was in a shelter. It was not long before Averi found himself at Outside In, an agency serving homeless and low-income youths in Portland. Soon after, in 2012, he was encouraged to participate in an intensive filmmaking workshop called Guerrilla Theater with Israeli-American filmmaker Nili Yosha. There he learned to operate a digital camera, lighting and sound recording equipment and compose camera shots and angles. Best of all, though, Averi was able to explore his lifelong love of writing by helping produce the film’s script. His skin is decorated with stick-and-poke text tattoos, but most of his writing, he said, is kept in the hundreds of journals he has managed to fill over his short lifetime. The film workshops at Outside In were his first opportunity to present some of his writing to a wider audience as well as distract himself from the many stressors of being young and on his own. “When your entire livelihood is condensed into ‘I’m 19 years old and I’m homeless, what am I doing with my life?’, it’s hard to be creative,” Averi said. “It’s hard to be anything besides in the mindset of ‘Where am I going to go, what am I going to do, how am I going to eat?’” Guerilla Theater at Outside In gave him an escape from that, allowing him to explore an artistic outlet he may have never been exposed to otherwise in a safe and supportive environment. Guerilla Theater has become own full-fledged organization called Outside the Frame, and the film Averi worked on, “The Lost Boys of Portlandia,” is set to premiere at the organization’s June 7 gala at Revolution Hall, alongside other short films produced by Outside the Frame participants. Based on the classic story of Peter Pan, “The Lost Boys of Portlandia” tells the tale of young people experiencing homelessness deciding whether to leave the “Neverland” of life on Portland’s streets to return to the mainstream society that judges and ostracizes them. Averi and other filmmakers will be in attendance to present their projects and answer questions from audience members. 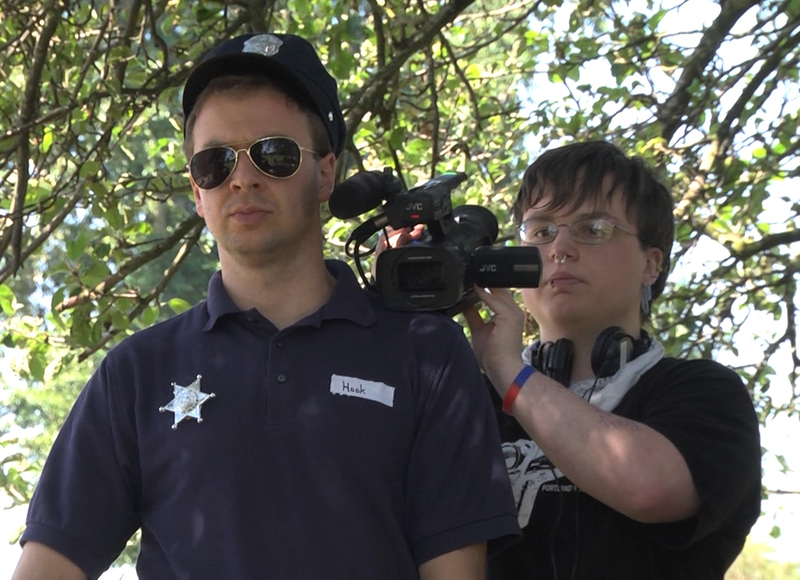 On the set of the “Lost Boys of Portlandia,” Jake Averi (right) films acting coach and “Captain Hook” Nicholas Kessler. A partner organization to Outside In, Outside the Frame engages youth experiencing homelessness in hands-on filmmaking workshops, giving them the opportunity to focus on a creative outlet, learn technical filmmaking skills and share their stories and perspectives with the wider Portland community. Yosha first planted the seeds of the organization in 2009 when she was hired by Outside In to run a peer education program funded by a three-year federal grant. That initial program, called Guerilla Theater, is the one Averi participated in. “I was like, how do I engage a group of transient youth who have a lot of creativity and a lot of energy and no tolerance for exercises in futility? Well, I’ll make movies. There’s something for everyone to do, and most importantly then you can get it out .there for the public to see and hear,” Yosha said. The daughter of acclaimed Israeli independent filmmakers, Yosha grew up understanding the power of film to change minds and wanted to harness that power to challenge stigmas against young people experiencing homelessness and housing instability held by film audiences and the participants alike. Yosha amicably left Outside In and ended the Guerilla Theater program after the federal grant ran out, but her experience making films with the youth at Outside In always stuck with her, and she worked to bring her program back. In June 2015, Yosha did just that when Outside the Frame became its own nonprofit. Now the organization relies on individual donations and money earned through contracting youth film workshops at Outside In led by Yosha and a team of professional filmmakers, and making media content for local businesses and organizations. So far, participants in the program have made short films and music videos exploring, in their own words, issues such as domestic violence, addiction, sexual health and daily life navigating homelessness as a young person. Exact numbers of the current Portland metro area runaway and homeless youth populations are hard to pin down. The 2015 Point-in-Time Count recorded 266 unaccompanied people ages 24 and under sleeping outside, in emergency shelters and in transitional housing. However, the report acknowledges that this figure may be well below the reality and the numbers of unaccompanied youth “doubled up” at the homes of friends or relatives is estimated to be much higher. According to Outside In’s 2014-15 annual report, the organization served nearly 800 youths in that time period. Outside In, along with Janus Youth Programs, New Avenues for Youth, and Native American Youth and Family Center are all part of the Multnomah County Homeless Youth Continuum, which is designed to serve about 1,000 youths each year with basic needs such as food and shelter, as well as case management, education and employment services, and transitional and independent living programs. But Yosha, who credits youth groups with inspiring and empowering her as a teen, sees arts interventions like Outside the Frame as the missing piece in what the city and county offers those in the continuum, providing a type of social and personal development opportunity other homeless and runaway youth social service programs can’t provide. Through the process of filmmaking, participants gain the skills that come along with working on a team, owning and developing a creative project and presenting that project for the world to see. Outside the Frame board Director Talilo Marfil agrees. Born in the Philippines, Marfil moved to California with his mother before settling in Portland with his stepfather – who soon kicked him out of the house at 16. From that point on, Marfil was homeless on downtown Portland’s streets. Throughout that time, Marfil was involved with Outside In. After being released from a two-year prison sentence, Marfil had the opportunity to participate in Yosha’s filmmaking workshop, where he pursued his interest in rapping and made his first music video, which he then screened before an audience of 600 people at the organization’s second film premiere at the Armory Theater. Today, the 26-year-old is busy with many social-justice projects, in addition to pursuing a certificate in videography. In addition to serving on Outside the Frame’s board of directors, Marfil continues to make music videos for himself and other local hip hop artists. He founded the Portland chapter of Hip Hop Congress, a nonprofit organization that uses hip hop culture to inspire and mentor vulnerable teens and young adults. He also works with Get Reel, the youth media program at MetroEast Community Media that also partners with Outside the Frame, and he is steadily building his own hip hop career. Outside In and Outside the Frame, he said, saved his life. 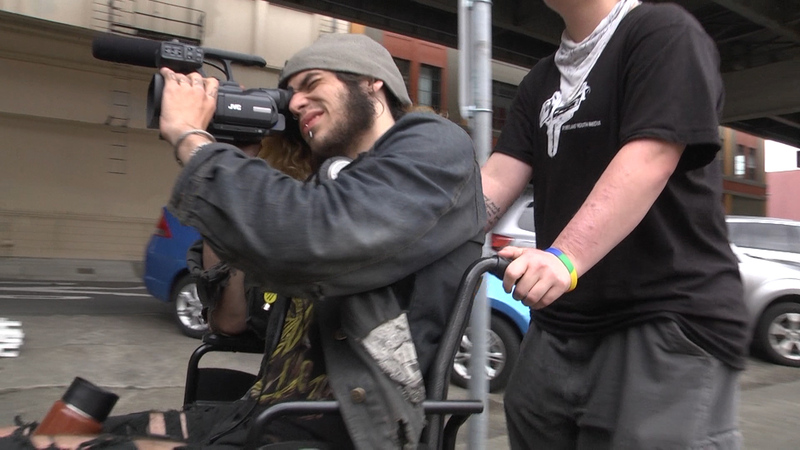 Joe Whiting filming a scene from the “Lost Boys of Portlandia,” with assist from Jake Averi. Yosha said others from the program have also gone on to pursue higher education and their dream careers, helped in part by the soft and technical job skills they gained through the hard work of filmmaking. At its current capacity, Outside the Frame serves about 50 teens and young adults a year, but Yosha wants to expand programming to serve even more youths and offer more advanced filmmaking training. “I want it to be able to change for the better the course of somebody’s life, not turn somebody on and then leave them hanging,” Yosha said. Yosha, Averi and Marfil hope the premiere gala on June 7 will help change the common narrative around youth homelessness in Portland. What: Outside the Frame, in collaboration with Outside In, presents “The Lost Boys of Portlandia,” a new documentary featuring the real lost children of Portland. In a riff on Peter Pan, homeless youth debate if and how to return to mainstream society while creating their own film version of the iconic story. The evening will include original film shorts by homeless youth and a Q&A with the filmmakers. When: 7 p.m. Tuesday, June 7, 2015. Doors 6 p.m.
Tickets: Free, all ages event. Tickets available at otfpdx.brownpapertickets.org. Donations welcome.